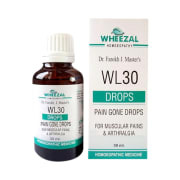 Wheezal WL30 Pain Gone Drop is used for the treatment of Muscular Pains & Arthralgia. It relieves pain the joints, pain in the knee, back, shoulders and neck. There are several reasons for muscular pain – excess physical stress or intense exercise regime, all can contribute to muscle ache and Wheezal WL30 Pain Gone Drop provides relief from such pains. Take 10-15 drops of Wheezal WL30 Pain Gone Drop in little water four times a day before meals or as directed by the physician. A licensed pharmacy from your nearest location will deliver Wheezal WL30 Pain Gone Drop. Once the pharmacy accepts your order, the details of the pharmacy will be shared with you. Acceptance of your order is based on the validity of your prescription and the availability of this medicine.